"This is the result of a fun workshop at the Adelaide Sewing Centre working with the Handiquilter Sweet 16. Working on a stitched hexagon grid, we were given some suggestions for filling the space. This one developed a life of its own, morphing into a collection of partial Mandalas, instead of remaining within the hexagon grid, although it can still be seen"
This quilt has beautiful free motion quilting all over, remember this is all quilted by moving the hands and the fabric (as opposed to a long arm where you move the machine around on top of the fabric) and Sheila does not use a stitch regulator on her Sweet 16. As with all quilts I think it is far better to view them in real life than through a photo, but I hope you can gain an appreciation of the work that has been put into this quilt through my photos. Another of the quilts Sheila entered was the very beautiful Stars and Sprigs and a Little More quilt which was entered in the Predominantly Appliqué Large category. When Sheila washed this quilt, a couple of the red fabrics ran and it was panic stations for a while. I believe the quilt was washed a total of FOUR times before all traces of the colour bleed came out. Sheila's quilters statement follows: Made from a pattern by Australian designer, Kim McLean, described by her as the Ultimate Scrap quilt, it uses a vast variety of classic and traditional prints. The leaves were entirely back basted and needle turned, taking almost two years to complete. Having been persuaded to use a solid backing fabric, the quilting was chosen to compliment the blocks and create a feature of the reverse and took in excess of 100 hours on my non-stitch regulated Sweet 16. The photos don't really do justice to this lovely quilt. I know Sheila agonised for ages about whether to quilt it herself or to get it quilted by a long-arm quilter, I think she made the right decision to quilt it herself, her quilting is really well done and is something I aspire to. thank you for posting about my quilts, and for your generous words. It was lovely to see our quilts hanging along side all the other beauties in the show. Well this is truly outstanding. Sheila you are to be hugely congratulated. Thankyou Pip for this expose of a very talented lady. Wow!! Sheilas quilts are amazing!! The artist statement is great for explaining all the work that has gone into the quilt. That quilt is just breath taking. Well done Sheila, I take my hat off to you! Loved seeing Sheila's quilts here. She mentions 100+ hours to quilt but no mention of how long all those many many blocks took to piece and applique. I do wish quilt makers would give equal credit to all that time spent to create a gorgeous top. 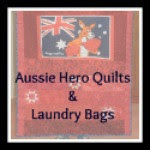 Thanks so much for sharing Sheila's fabulous quilts with your readers.